We’d love your help. Let us know what’s wrong with this preview of Writer Get Noticed! 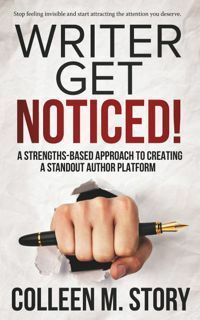 A Strengths-Based Approach to Creating a Standout Author Platform by Colleen M. Story. Veteran writer and motivational coach Colleen M. Story helps you break the spell of invisibility to reveal the author Stop feeling invisible and start attracting the attention you deserve. •	Why improving your writing skills isn’t enough. •	Why it’s critical you discover your strengths...and how to do so. •	What’s stopping you from finding the readers who love your work. •	What you really want from writing and why that matters. •	Easy methods to help you build a more successful author platform. •	What truly motivates you and how to use that to succeed. •	The author theme that unites your creative work and fits your style. •	How imposter syndrome can stall your progress, and how to overcome it. •	How to make better decisions about your writing career as a whole. To ask other readers questions about Writer Get Noticed! A Strengths-Based Approach to Creating a Standout Author Platform, please sign up.